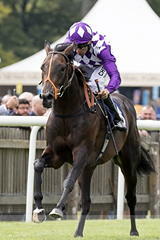 After combining to take the valuable six-furlong prize 12 months ago with Stormy Clouds, Richard Hannon and jockey Sean Levey struck again after Tangled backed up his nursery win at last month's July Festival at Newmarket. Bursting through the far-side pack deep inside the final furlong, the 15-2 shot was not for stopping once hitting the front, with Levey pushing his mount out to defeat Great Prospector by a neck. Favourite Hey Jonesy was best of the stands-side finishers, a further half-length back in third. Hannon said: "We've always liked him. He was prone to bouts of bad behaviour in his early days. We fancied for him a nursery at Goodwood, but he burst out the stalls and his chance had gone (he was withdrawn as a result). "He went up 4lb for standing in his box, so his form has worked out. We've been second in this a few times so it's nice to win it again as it's a huge pot. It's nice for Sean, because he had been moaning to me about his car. It has done 170,000 miles and it's only 180,000 to the moon. "At least he can buy a new one now." Richard Fahey said of Great Prospector: "I'm a bit disappointed as I thought we'd win, but Paul (Hanagan) said he was a little bit on his head. "He'll probably now head to Doncaster for the big sales race there. Six and a half furlongs should suit him a little bit better."